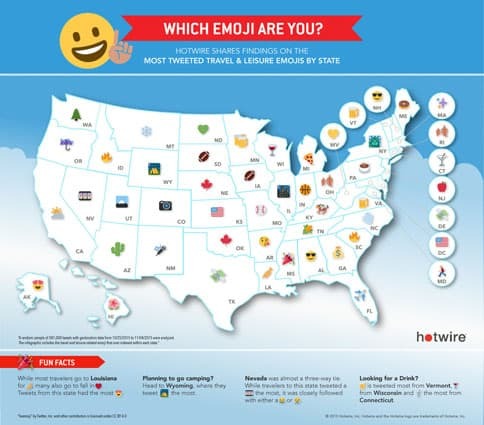 Just in time for the holidays, Hotwire has announced the top travel and leisure emoji used state by state. From the ever popular “tent” in Wyoming to “snowflakes” in Montana and Alaska and “tropical drink” in Hawaii, the data offers a fun, industry-wide read that shows that consumers across the country are feeling optimistic leading up to the peak holiday travel season. Perhaps surprisingly, the most popular emoji used by travelers in Vermont is not skiing, Ben & Jerry’s, or maple syrup. It was beer, likely a (literal) symbol of the state’s fast-growing craft beer movement and the tourism that has followed. The study examined 581,000 tweets sent between Oct. 25 and Nov. 4 of this year, along with their geolocations. It then identified the most commonly used emojis related to travel and leisure within those tweets. While Vermont is the top beer-drinking state, it was far from the only state with drinking icons. Wisconsin was the top wine-drinking state; Connecticut loves its cocktails and Hawaii its tropical drinks. Many top emojis were not surprising, like camping’s popularity in Wyoming, where they tweet “tent” the most, and Kansans’ love for America, where the American flag emoji was used more than any other. Travelers to Nevada, however, couldn’t make up their mind. The “slot machine” emoji won out by a hair, with a “crying smiling face” or a “crying sad face” close behind. Sports were another popular category with “football” winning out in South Dakota, “baseball” in Missouri, and “basketball” in North Dakota. Other emojis were a bit surprising, such as the popularity of traveling to Louisiana to fall in love, symbolized by the smiling faces with heart-shaped eyes. Those in Maryland apparently are most obsessed with their cars and Tennesseans with emojis themselves, averaging 2.08 emoji per tweet. Hotwire.com is a leading discount travel site with low rates on airline tickets, hotel rooms, rental cars and vacation packages. Launched in 2000, Hotwire, Inc. obtains deep discounts from its travel suppliers to help travelers book unsold airline seats, hotel rooms and rental cars. mt😤😤😤😤😤😠why is the nebraska state emoge a leaf!! !